Indiranagar is indie central of Bangalore, so much so we call it Indieranagar. Amazing puns aside, the hood's independent clothing and lifestyle boutiques are some of the best indie stores that we have across. They put a spotlight on Indian art and craft, handicrafts, our heritage textiles and independent and upcoming designers from around the country. Although we love Varnam for their quirky toys and offbeat decor (think Giraffe Salad Mixers and Goobe Lamps), they’ve got quite the collection of clothing and accessories on offer too. We’re talking quirky prints, easy fabrics and comfortable designs. Make sure you check out their extensive collection of shirts. And do take a look at the handcrafted jewellery that’s up for grabs too. Timri supports small-scale, upcoming designers who make dresses, tops, Indo-western wear, jewellery, footwear and bags. Kilim bags, ikat dresses and embroidered footwear are the highlights here. Plus, you also need to check out their in-house collection of apparel for men and women as well as accessories such as cute bow-ties. Anahe curates a large collection of formal and semi-formal outfits, and anyone who loves couture is bound to have a ball here. And all the outfits are sorted according to colour, starting with white and neutral shades, and ending with navy blue and black, with everything in between, so there’s plenty to browse. The label is about preserving and promoting India’s textile heritage, sustainability, and sleek designs. Their collections are all about showcasing that through ensembles such as pink jackets crafted with Banarasi silk and embellished with Jamawar motifs and Kamdhani top adorned with Japanese-influenced motifs. 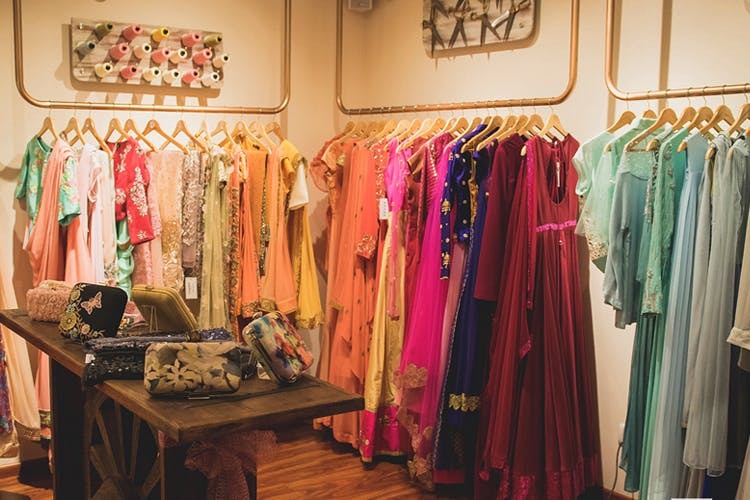 Lila's cute and chic boutique in Indiranagar is where you need to head to for easy breezy wardrobe options that include kaftan dresses, maxi-kurtas, and relaxed trousers and shirts for men and women.ome in minimal prints and in mostly plain colours. There's also tops and dresses for women that feature gingham, stripes, colour blocks, and even ethnic prints such as ikkat. The Jaipur-based brand does ethnic wear in bright pops of colour and featuring Jaipuri prints. You get kurtas, salwars, lehengas, tunics, dresses, and bottoms in refreshing colours such as lavender, pink, turquoise, cyan and indigo. Plenty of sizes, length (you get them in short, medium, and long) and with an array of collars -- Mandarin, boat and round necks. The little boutique will fix you up with everything you need for a party, a sangeet, or brunch with the girls. Elaborate lehengas, saree blouses, cotton kurtas, maxi gowns and even pretty little skirts are what you’ll find here. You will also love that even though the prices vary from design to design, you will find options starting at an affordable INR 1,100. You can get your party dresses and evening gowns sorted from INR 1,600 onwards.